Not long ago, I visited banking ambassadors in the Capital One student-run branch at Parkdale High School in Maryland. I discussed my life, my career, and my backstory of being born and raised in Brazil. I quickly realized I wasn't what the students expected. They thought a stuffy banker from a privileged background, someone who looks and speaks differently than I do, was coming to talk to them. And while I thought it'd be my words of wisdom they'd focus on, it turned out to be the personal connection and time spent alongside them that they truly valued. 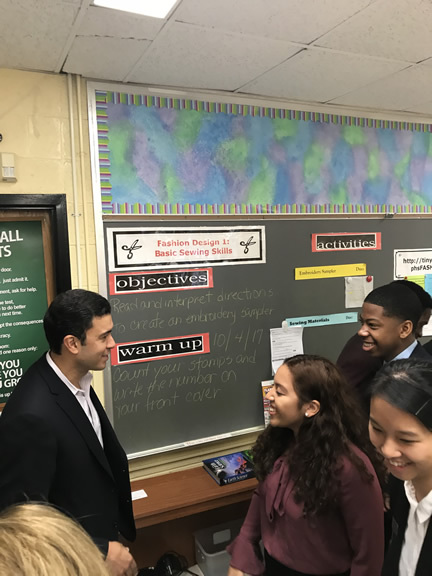 Kleber Santos (left), Retail and Direct Bank President at Capital One, recently spent time meeting with young banking ambassadors in the Capital One student-run branch at Parkdale High School in Maryland. At community-minded companies like Capital One, creating goodwill in local communities is about building relationships, leadership that inclusively unites people, and the equity of donating time and energy. Spending time with these students was a powerful reminder, for me, that building goodwill in the community goes beyond the dollars and cents of making grants or charitable contributions. It's about building relationships, leadership that inclusively unites people, and the equity of donating your time and energy. At community-minded companies, "giving back" goes far beyond financial support. They also provide volunteer assistance, advice, venues and more, frequently partnering with other impactful nonprofit organizations to make a positive and lasting impact. 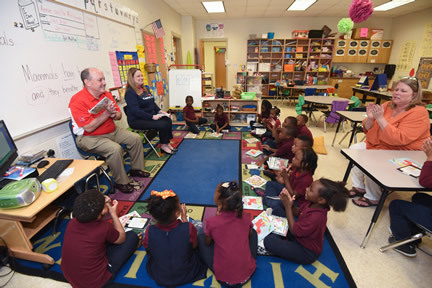 Above, Capital One Retail Banking executives Hugh Hamilton and Jennifer Windbeck recently read to students at Claiborne/Howell Park Elementary in Baton Rouge, La., as part of an event at which Capital One and nonprofit Heart of America Foundation provided 1,000 books to students at the school. Capital One recently was recognized by the Points of Light organization as a top community-minded company in the 2018 Civic 50*. This year marks the sixth time we've been awarded the honor, and it's one I take great pride in because, in the Banking division, we strive to be an "ear of the community." Strengthening the communities we serve is engrained in our DNA. After all, many of our own Associates live, work, and play in the neighborhoods we serve. Future Edge, a five-year, $150 million initiative by Capital One to help more Americans succeed in a digital economy. We've had the privilege of collaborating with leading educational and community organizations across the country to address areas of critical need that impact the nation's current and future ability to grow and prosper in the digital age. A signature partnership with Dress for Success (DFS) in 15 Capital One markets that includes hosting a multi-week, intensive financial education program in select Capital One Cafés. Café ambassadors serve as session facilitators and create strong bonds and relationships with program participants. The fostering of connections within neighborhoods we serve by our Café Engage Team, which seeks to improve the economic health and well-being of our communities through year-round hyper-local efforts and volunteerism that make a real impact. The events enable our ambassadors to engage in meaningful, and ongoing, dialogue with people in our communities. Through its five-year, $150 million Future Edge initiative, Capital One is helping more Americans succeed in a digital economy. 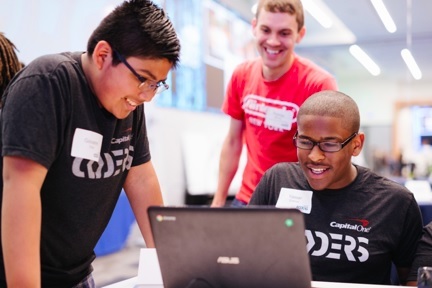 One of the ways Capital One lives up to the promise of Future Edge is through its C1 Coders program, a 10-week course that teaches students software engineering and how to develop apps for mobile devices while growing computational thinking skills. We are committed to doing more, and we know that we're not alone in making a positive difference. The cumulative effect of companies, large and small, supporting their communities in ways not directly tied to the bottom line is a powerful thing. We salute the other Civic 50 honorees and the scores of other businesses, organizations, families, groups, and individuals throughout the U.S. who are lending an ear to inform how to more positively impact their towns through listening, financial support, leadership, and volunteerism. They are listening to stakeholders in their communities and making a positive and lasting change for people in need. One day and one life at a time. * The Civic 50, an initiative of Points of Light, recognizes the 50 most community-minded companies in the nation each year as determined by an annual survey. By benchmarking and celebrating best practices, it provides a framework for good corporate citizenship and showcases how companies can use their time, skills and other resources to improve the quality of life in their communities. Capital One has been a Civic 50 honoree every year since Points of Light conducted its first survey in 2012.